HABA 2299 - A magnetic tile arranging game that will lead little ones and older ones, alike, into the fantastic world of 1000 nights. Whoever lets their imagination go will create magnificent palaces, nice patterns and much more. Magnetic foil must be applied to the wooden parts. 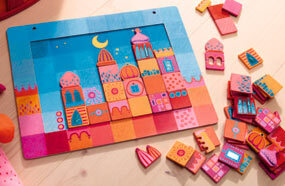 Comes with 80 wooden tiles, 10 motifs in original size to copy, self-adhesive magnetic foil and frame. Frame measures 12.8" x 10.4". Recommended for 3 to 10 years.